Southern California Edison (SCE), an Edison International company, said costs associated with inspections and repairs to the 2,200 MW San Onofre Nuclear Generating Station (SONGS) could land between $55 million and $65 million. Both units at SONGS are currently shut down for inspections, analysis and tests. Unit 2 was taken out of service Jan. 9 for a planned outage. Unit 3 was taken offline Jan. 31 after station operators detected a leak in one of the unit’s steam generator tubes. In April, Southern California Edison told the NRC that the company completed additional inspections of the SONGS Unit 2 steam generators, based on Unit 3 findings. SCE had identified wear in two of the 19,454 tubes in the Unit 2 generators that was similar to the type of wear that was previously seen in Unit 3. Utility aims for June Restart of San Onofre Plant – But then Retracts. LOS ANGELES – The utility that operates the San Onofre nuclear plant is looking at a possible June restart, while costs related to the shutdown could climb over $100 million, a senior executive said Thursday. Southern California Edison is drafting a plan under which the twin reactors would run at lower power, at least for several months. Engineers believe that will solve a problem with vibration that has been causing unusual wear in tubing within the plant’s massive steam generators. “By operating at lower power … the vibration does not occur,” executive vice president Stephen Pickett said. The state utilities commission is set to approve $64 million for new seismic studies at San Onofre, though it does not appear that the project will receive the same level of outside scrutiny being applied at the state’s other nuclear plant. A proposed decision issued March 16 by Administrative Law Judge Robert Barnett concluded that an Independent Peer Review Panel for San Onofre will be different from the one in play at Diablo Canyon in central California. The California Public Utilities Commission is set to finalize the ruling May 10. “The (review panel) for Diablo Canyon has proved too cumbersome for prompt and efficient action. A modified panel is needed,” Barnett stated in his proposed decision. 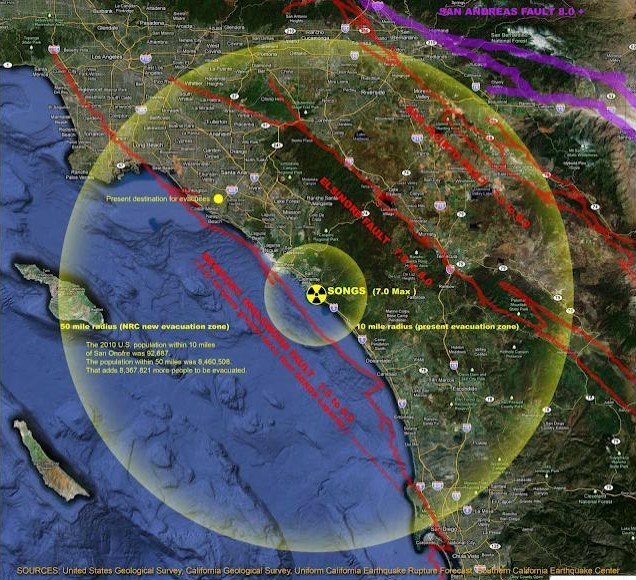 A state law passed in 2006 requires both of California’s nuclear plants to do a series of new two- and three-dimensional earthquake studies to help the public better understand their seismic vulnerability. Evacuation zone should be extended from ten miles to fifty.